We’ve recently imported 5,148,400 new records from the Library of Congress into OverCat, LibraryThing’s data repository. This brings the total number of records in OverCat to nearly 78 million! That’s 78 million high-quality library (MARC) records you can use in cataloging on LibraryThing. This new dataset was produced by the Library of Congress from records in the 2014 Retrospective file sets—the most recent currently available. The Library of Congress provides these MARC records as part of its MARC Open Access program. Although LibraryThing adds MARC records to Overcat as members search for them, this is our first mass update from Library of Congress data since OverCat debuted in 2010. Thanks to developer CCatalfo‘s efforts to make this happen. Notice anything different in OverCat? Join the discussion and tell us about it on Talk. In honor of National Library Week in the US, LT staff got to talking about our favorite libraries around the world. Read all about our favorite places below, and come share your own on Talk. With few exceptions, all of our favorite libraries can also be found on LibraryThing Local—LT’s way of connecting members to the real world of bookstores, libraries, and book events. My family’s personal library. I grew up thinking a family library in the thousands, with a real intent to cover most topics, was entirely normal. 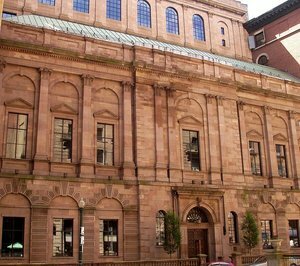 Boston Athenæum. Growing up, one of my best friends was the son of the director, so I spent a lot of time there, and he could take anything out. I particularly remember the day we spent finding all the very oldest and coolest books on magic and witchcraft they had. 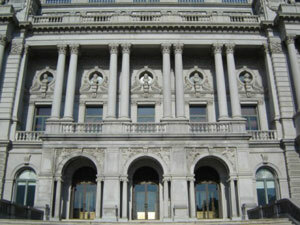 Library of Congress. I went to Georgetown, but apart from the Woodstock Theological Library in the basement, it was only so-so and needed more. The LC—arguably the greatest library in the world—was my library and, really, my university too. Boston Public Library. The BPL is, with the NYPL, one of only a few publics that try to maintain a serious research collection. I did a lot of work there in High School (I was a weird kid okay?). The main reading room is my idea of Heaven. Beinecke Library. Architecturally, the most gorgeous library I know. I took my son to Yale just to see the library, and it was closed! But I recently made a replica for him in Minecraft. Check out Beinecke on video! 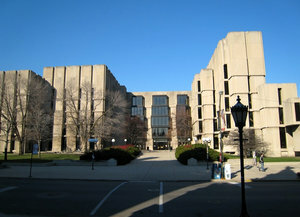 University of Chicago Joseph Regenstein Library. My alma mater’s flagship library, and how I got my official start in my career in libraries—shoutout to the Bookstacks Department! “The Reg,” as it’s known on campus, has a foreboding, Brutalist exterior, but inside, seemed to have everything I could ever want. This includes UofC’s Special Collections. Six Mile Regional Library District Branch. My very first public library as a child. I was hypnotized by the rotating shelves, and I have vivid memories of asking the librarian for more books on sharks, please. The Choral Library at Rockefeller Memorial Chapel. This one isn’t open to the public, and it’s in more or less a closet behind the King’s balcony. It was stuffy, crowded, and I loved it. It had a rolling ladder, just like the movies! My fellow choral office assistant and I mostly had it all to ourselves. Seattle Public Library. Visually striking both inside and out, and always busy. What’s not to love about “the mothership” (as some of us are fond of calling it)? SPL is really on top of events programming, too: from helping folks with their taxes to speaker series. Tuscaloosa Public Library. 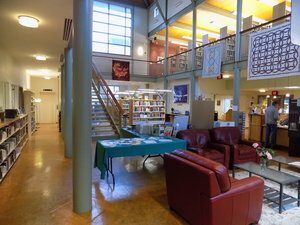 My grandparents’ local library, which has been a great resource for them for years. Possibly my favorite part is that, rather than a perennial book sale, the Friends of the Tuscaloosa Library Bookstore is open almost year-round, and is partly to blame for my home library’s shelves overflowing. 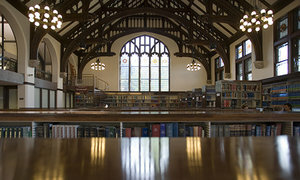 Mount Holyoke College Library. The building itself makes all sorts of “most beautiful library” lists, but this is where I spent much of my undergrad days, reading, sitting in the stacks in front of the HQ range grabbing books for my thesis, and occasionally napping in my carrel, when I wasn’t downstairs working at the Archives and Special Collections. Boston Public Library. In the early days of LibraryThing, I would occasionally set up camp and spend the day working from the BPL. The McKim Building is beautiful, the collection itself is vast. Mattapoisett Free Public Library. This was the library of my childhood, a tiny lovely place, complete with an old Civil War canon outside for climbing on. New York Public Library. 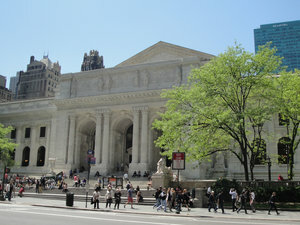 I have written many books—at least in my head, if not yet on paper—that take place in the NYPL. Cambridge Public Library. My new everyday library. University of Tasmania Morris Miller Library. Many an hour I spent studying in the upper levels of this library, browsing the science collections and using the free internet to research my next weekend trip. It was one of the places I really felt welcome when travelling alone and overseas for a semester. Newport Public Library. Sadly, this library closed while I was in college (don’t worry, a new cultural center took its place). The library used to be in a pretty little brick building on Main Street in my hometown. I was an avid patron there from 5 years old, and remember cleaning up the grounds with my Girl Scout Troop as a kid. 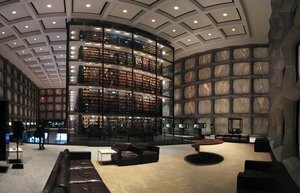 Beinecke Library. I’ve never been, but I would love to go! Rare books plus beautiful architecture, sourced with marble panels from Vermont? Count me in, please. Trinity College Library. Another library I’d love to visit. The Long Room makes me think of grand fantasy tales, getting lost in the shelves in a world like Harry Potter’s or Redwall’s, and please say there are track ladders I could maybe ride without getting in trouble? Tie between America’s Test Kitchen and American Cheese Society. I’m quite partial to libraries centered around food, and I often find myself browsing these libraries’ catalogs and drooling over their books. Skidompha Library. This is a sentimental decision, as my mother is the director and I basically grew up in its shelves. They have won several state and national awards for programming, facility, and general awesomeness, but my favorite feature was the heated flooring in the children’s story circle. Trinity College Library. Can you have an aspiration to just become a library? Because I could do that, here. Book of Kells was definitely bucket list material. Biblioteca delle Oblate. I work from my laptop around the world. When I was in Italy a few years ago, this branch of the Florence public libraries, overlooking the Duomo, provided me a sunny view, killer macchiatos (and, uh, wine), and steady/free wifi. Simply gorgeous. Smith College Josten Performing Arts Library. Worked in this architectural ode to the 1960s in college, shelving music scores among squashy armchairs, becoming conversant in the Cutter Classification system. Biblioburro. This library travels on braying hoof through a region of Colombia, bringing books to children who don’t have libraries of their own or other access to books. Such an elegant solution, even if the fuel costs are measured in hay and not heating oil. Bridgton Public Library. I was this library’s Matilda many, many years ago. North Bridgton Public Library. I lived next door to this library during my freshman year, and spent many hours poring over earth science books for my “Whitney Reports.” Locals will know what I’m talking about. Whitney himself lived just a few blocks away. Lake Region Middle School Library. Moving to Maine from Puerto Rico in the middle of a school year then skipping a grade didn’t make for the most wonderful 7th grade experience. Thankfully, this library and its wonderful librarian were there. I wish I could remember her name, but mostly I remember her storytelling. She made The Polar Express for me. 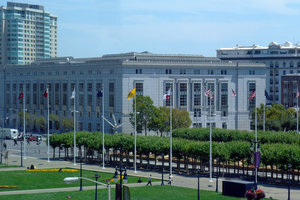 San Francisco Public Library. I went to the library two days before I moved cross-country back to Maine to renew my library card. I still can’t bear to part with the physical card, though my e-borrowing privileges expired in 2015. Tim’s family’s personal library. I’m pretty sure that the book stacks I make every time I housesit are primarily made up of Lisa’s books, maybe some of Liam’s. Tim’s are certainly fascinating to browse the titles, if a bit scholarly for my non-required-reading tastes. New York Public Library. As a book-loving kid living in Texas, I dreamed of visiting this library, living in this library. I first made it to NYC in 2010 and was thrilled to meet Patience and Fortitude, and to wander around this marvel for hours. It did not disappoint, y’all. Boston Public Library. After moving to Boston for library school, I spent many days getting to know the BPL: the collections, the artwork, the history. It still feels like home despite having left Boston four years ago. Baylor University Armstrong Browning Library. This absolutely beautiful research library maintains the largest collection of the works of and works pertaining to Robert and Elizabeth Barrett Browning in the world. In Waco, Texas! I would many times attempt to study in the library only to be distracted by the stories it held. St. Louis Public Library. This lovely piece of history underwent a complete restoration recently, the results unveiled on the library’s centennial in 2012. I love so much about this space: the stunning Grand Hall, the Graham Greene and Joseph Heller quotes on the ceiling of the stacks, the revamped children’s space. But most of all, I love that my husband and I got engaged here. Trinity College Library. One day I’ll get there, y’all. Have a great National Library Week, and come share your favorites in the discussion on Talk! The 75 Books Challenge for 2010 group has a “Take It or Leave It” challenge for August, where they read a book by one of the authors who will be attending the 10th annual National Book Festival. You don’t have to be part of the 75 Books Challenge group to decide to read a NBF author’s book. Even if you can’t go to the festival itself (in Washington, D.C. on September 25), you may be inspired to read a book by one of the participating authors. Maybe this is your chance to finally pick up Everything Is Illuminated, Outlander or Read to Your Bunny. You can join the 75 Book Challenge folks on their thread, or keep your reading choice to yourself. I can’t go to the festival this year, but I’ve arranged to ask many of the authors in attendance ONE interview question each. If you’d like to be the one to ask any of these authors a question, post it here before September 1st. See the entire list of authors. LibraryThing now has 32,287,447 books cataloged—finally surpassing the number of books in the Library of Congress (32,124,001 according to the ALA Fact Sheet). We’ve been waiting for this for years, as we slowly made our way up the list. Alas, now that we’ve topped it, what have we to aspire towards? We’re not trying to say that LibraryThing compares with the LC, in a “real library” sense. We have, for example, 24,119 copies of Tolkien’s The Hobbit in LibraryThing, and 15,545 copies of The Curious Incident of the Dog in the Night-Time (and don’t even get me started on the Harry Potter books! * No real library stocks books in those kind of quantities! But the fun of LibraryThing isn’t just in the widely held books, it’s in those that are shared by only 10 or 20 other members. It’s easy to find someone who has read The Hobbit. Finding someone to discuss your more obscure books isn’t quite so simple. But on LibraryThing, you can. There are 8 members who list The National Uncanny: Indian Ghosts and American Subjects—8 members who can find each other and have a common interest. The “long tail” of LibraryThing is long indeed. The Library of Congress just posted the video of my talk there. Link and description over at Thingology. I must say, getting mentioned by the ALA, even if as a joke, is a little thrilling. But it all comes around, since Steven Cohen said in Public Libraries magazine (March/April 2006), “I’ve seen the future of online catalogs, and its name is LibraryThing.” March/April, huh? Was he fooling? *Sic on the caps on “Wiki.” Since American Memory is a product of the Federal Government, someone SHOULD make a wiki for it. I’m sure parts would get worse, but parts would also get better.